Sony MDR-ZX770BN review | What Hi-Fi? A passing knowledge of the tech industry, or just a quick browse around your local Currys store, should be enough to confirm there are absolutely loads of pairs of headphones on the market. So many, in fact, we could never hope to test them all - so we have to be rather selective about the ones we do test. This inevitably means we occasionally overlook a pair that’s actually quite interesting, such as the Sony MDR-ZX770BNs that launched back in 2015. So why review them now? A big reason is that they’re now widely available at very close to the magical £100 figure. That, combined with the usual Sony kudos, has seen them surge in popularity to such an extent that we couldn’t resist buying our own pair to find out what all the fuss is about. The good news is that much of the fuss is justified, particularly in terms of design and features. They can be beaten for sound quality, though. 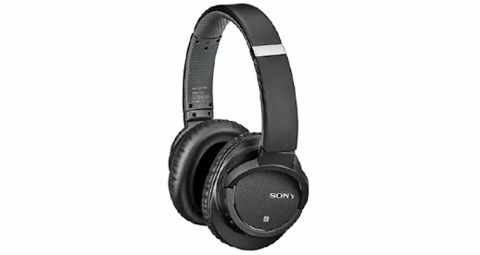 Without a doubt, the physical design of the Sony MDR-ZX770BN headphones is among their most impressive qualities. That may sound a little like damning with faint praise, but this is one of the hardest things to get right. These Sonys are spot-on – they feel chunky and solid in a way the likes of Philips' SHB8850NC can’t match, and are also (to us, at least) more stylish and understated. They’re supremely comfortable too, snug and secure, with head-hugging cups soft enough to create a seal around your ears while also remaining comfortable for long periods of listening. There are a fair few buttons and switches dotted around the ear cups, but Sony has clearly put a great deal of thought into design and placement. Unlike many rival headsets, which require constant removal so you can remind yourself what each button does, the Sony MDR-ZX770BN’s buttons feel different enough to make general use intuitive. Bluetooth and noise-cancelling are the headline features here, and both are impressive for the money. aptX Bluetooth ensures signal quality remains high when using the headphones wirelessly. You will still get a quality bump by plugging in the bundled cable (the headphones can be used passively to save battery life), but you won’t be disappointed when listening cable-free. Active noise-cancelling headphones aren’t designed to block out random noises, such as typing on your keyboard or someone talking to you from close proximity, and the Sony MDR-ZX770BNs are no different. They’re more capable of cancelling out consistent noises, such as an air conditioner or the hum of an engine, leaving you able to better concentrate on your work, music or movie. Unlike many rival systems, the MDR-ZX770BNs’ noise-cancelling doesn’t introduce a background hiss of its own, and doesn’t fundamentally change the sound quality. There are a number of other features that are worth mentioning. Microphones in each ear cup enable hands-free calling, and there’s a multi-purpose switch for play, pause, skipping forward or back and answering calls. There’s also NFC for easy pairing of the headphones with an appropriate phone, and Sony claims the battery will last around 13 hours from a full charge. It should be clear at this point that Sony has done nearly everything right with the design and features of the MDR-ZX770BNs - particularly impressive given the affordable price. Unfortunately, the fly in the ointment is sound quality. Not that these Sony’s sound bad. In fact, start listening for the first time (after a good period of running-in, of course) and you are likely to be impressed by how open and spacious the presentation is. Play alt-J’s Every Other Freckle and the sound stage is expansive, airy and three-dimensional. Each instrument given space to breathe. This is a hard thing for headphones to get right, and even the rival Philips SHB8850NCs sound rather enclosed and congested by comparison. Detail is good too, and there’s a clean smoothness to notes that is, in some ways, quite sophisticated – certainly at this end of the headphone spectrum. The problem is these Sony headphones are just too smooth for their own good. They lack both punch and excitement. This is, at least partly, a problem of timing – while each instrument having spatial independence is impressive, the fact they aren’t rhythmically coherent robs the presentation of its drive and energy. There are issues at both ends of the tonal spectrum, too. Treble is generally rolled off a bit at the top, which sacrifices some sparkle. Often this is done to avoid harshness, yet with the wrong tune the Sony’s treble still somehow manages to annoy. With Idlewild’s Take Me Back to the Islands, for example, the strumming of guitar, as plectrum hits strings, is brought forward in the mix and also sounds a little hard and unnatural. The bass, meanwhile, initially impresses on account of its depth and weight, but it’s lacking balance and definition. Again, it’s smoothness to a fault. To their credit, the Sonys don’t allow bass to drown out or soil the mid-range, which is always clear and detailed in its own right. In other words, it’s not taking anything away from the rest of the presentation. It’s just not adding much worthwhile. However, despite these sonic flaws, this isn’t a poor pair of headphones. On the contrary, there’s a huge amount to like here. In fact, the thoughtfulness and success of the design and features only serve to make these relatively minor flaws all the more disappointing. The truth is, though, these aren’t the headphones to buy if you’re looking for an engaging and exciting musical experience. But if you’re a commuter looking for a super-comfortable pair of noise-cancellers to break up the journey and not break the bank, these Sonys are well worth giving a try.